I’ve visited Turkey eleven times, and always return in awe of the honesty of Turks. I’ve written here about the lengths Enver Beyazyuz went to in order to return my wallet, which he had found in the men’s room at an Istanbul Starbucks. And here, about the Gaziantep cab driver who trusted us to call him for a return trip so we could pay him after he had been unable to change the TL 20 bill (about $12) I had offered. On my latest visit my daughter, Susan Le, was lingering over breakfast coffee when Johann, a fellow guest at our hotel in Cappadocia (the Esbelli Ev—visit Cappadocia and stay there if you can!) 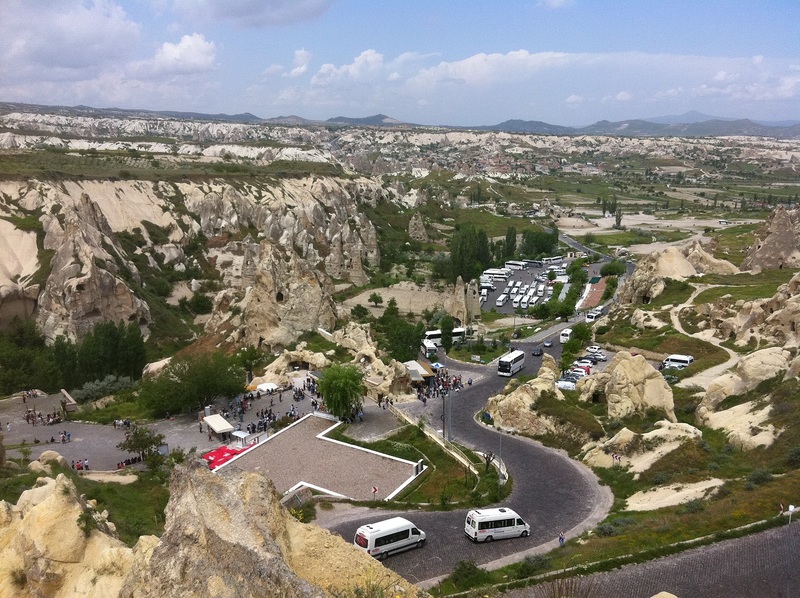 sadly recounted how he had lost his wallet, stuffed with IDs and credit cards, at the huge Goreme Open Air Museum (photo). My friend Arzu Tutuk (best guide in Istanbul, hire her when you go there) says if you lose your mobile phone in Turkey the finder will first refill with additional minutes, then track you down and return it. I wouldn’t be surprised.